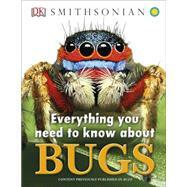 Everything You Need to Know about Bugs is an interactive read that any child interested in insects will love! This interactive read is full of fun insect facts, an insect identification guide, and key information about recognizing bugs and creepy crawlies all around. Identify bugs you might see in the backyard or camping, and find out about bugs you've never heard about before — it's all in Everything You Need to Know about Bugs, your complete bug and insect resource. Bugs come in all shapes and sizes, and have incredible and varied abilities. Children will love discovering more about the fascinating, and often hidden, world of insects and bugs.